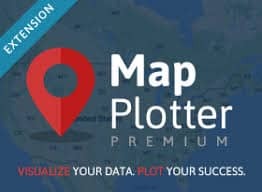 Extentia has recently launched Map Plotter Premium Extension, an upgrade to its Map Plotter Premium app that helps businesses map and geographically visualize their business data and customer information. With this extension, the app can now be used in the Professional Edition and can be customized based on specific requirements from users. Pre-installation of the Map Plotter Premium (base package) is required. Plot all Objects: The app automatically geocodes the addresses in standard and custom objects and plots data on the map for easy visualization. View Data in Clusters: Large numbers of markers are clustered to ensure a clean and clear visual of data on the map. Use Drawing Tools for Selection: Outline specific, custom areas on the map using the drawing tools, to view plotted points within those areas. Identify Locations within a Radius: Provide a custom radius to view other data points around the selected location. Save Searches with Fields Filters: Set filter criteria, and save these frequently used searches for convenient access at any time. Color Coded Pins: Differentiate between Accounts, Leads, and Contacts by color coding the pins for each Sales force object. In addition to that, users can also select a specific address to be highlighted on the map. View Location Information: Find out more about the points plotted on the map. Learn about the weather, restaurants in the vicinity and places to stay. Get Directions: Find directions between multiple points to efficiently plan routes. Easily switch to Google Maps or Apple Maps, for driving instructions. Get Reports on Geocoded Data: Generate status reports to diagnose the geocoded queries which were not successfully plotted on the map. Availability: Immediate on Salesforce AppExchange.